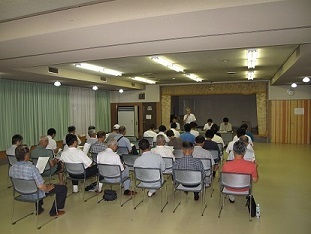 Over 7 month 27 from the date (month) 8 month 5 day (water), the "resident autonomy basics regulations and local creation district meeting" in the town 4 venue (Daimon-Nagakubo-Furumachi, each district of Wada), all venue While you come to the people of about 90 people together, it was held. In the meeting, while to meet also in demand, such as I want an explanation and exchange opinions in front of the stage that would finished the draft, initiatives and local wounds towards the enactment of residents self-government basics regulations that the current town are underway About town of efforts to raw (the "population vision" of NAGAWA version of "comprehensive strategy" development) there is a description from the town of the person in charge, from the participants, such as questions or comments on their respective efforts It was issued. In the town, while based on the comments received, we will promote the development work.